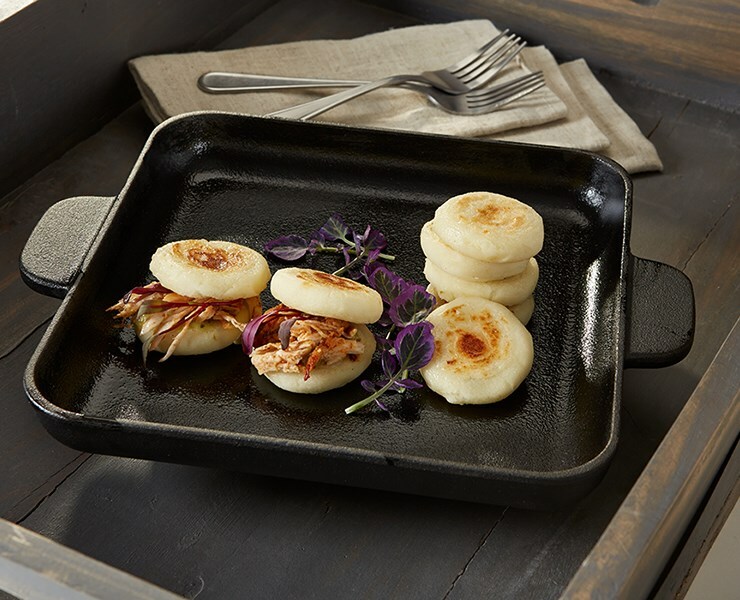 A traditional and popular accompaniment / snack in Spain and several parts of Latin America; arepas have seen a steady adoption in menu placement throughout North America due to their crisp and creamy texture, and exceptional corn maize flavor making them ideal for any culinary adoption. To best meet your customers’ needs and expectations, Kabobs’ culinary team have crafted a miniature version of this classic item, with an impressive flavor enhancement. Our team takes pickled jalapenos, paired with a cool creamy blend of Monterey Jack and cream cheese, then stuffs into a traditional maize / corn pastry. Perfect as-is, or can be topped with a wealth of dining accompaniments. From frozen bake in a Pre-heated 350°F convection oven for 8-10 minutes or until golden brown. Or, from frozen deep fry at 350°F for 3-4 minutes or until golden brown. Or, from frozen pan fry over medium high heat once hot add the mini arepas. Cook for 2-3 minutes then flipping and cook for another 2-3 minutes until or until golden brown. •Hors d’oeuvre Component: Top with variety of items (Cochinita Pibil, Chicken Mole, Ceviche, Roasted Vegetables, BBQ Pork, Guacamole & Queso Fresco, etc…). •Accents to Small Plates: Accompaniment to salads or soup. •Spanish and Latin American Inspired. Addresses current dining trends for authentic regional cuisine. •Preparation Versatility: Baked, Fried, or Pan Seared.